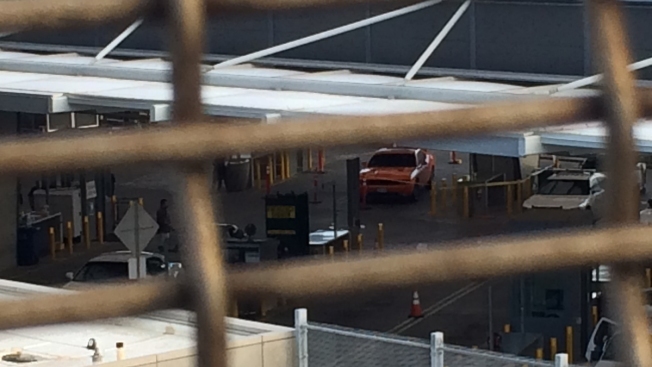 The two people found not breathing at the San Ysidro Port of Entry were inside the trunk of this orange vehicle, as seen here from a pedestrian bridge near the border crossing. Two men have died after allegedly attempting to cross the border illegally in south San Diego while in the trunk of a car, U.S. Customs and Border Protection (CBP) confirmed Tuesday night. According to CBP officials, at around 2:30 p.m. a U.S. Citizen arrived at the San Ysidro Port of Entry driving an orange 2012 Dodge Challenger. A CBP officer referred the car and driver for a more in-depth inspection. Once the car ran through the port’s imaging system, CBP officials said anomalies were detected in the trunk of the vehicle. Officers opened the trunk and found two men inside – a 28-year-old and 20-year-old – both unconscious and not breathing. CBP officials called the San Diego Fire-Rescue Department for emergency assistance. Crews transported both men to local hospitals, one to Scripps Chula Vista and the other to Sharp Chula Vista. The men both died shortly thereafter, CBP officials said. They were both citizens of Mexico. “The incident is unfolding and under investigation, but CBP will provide more details as soon as possible,” a CBP spokesperson told NBC 7. The names of the men inside the trunk were not immediately released.